The Unites States government owns almost one-third (28 percent) of the entire nation. Through various agencies that include the United States Forest Service, the National Park Service, the Bureau of Land Management, and the Fish and Wildlife Service, the total owned “by the people, for the people” comes to a staggering 640 million acres of land. 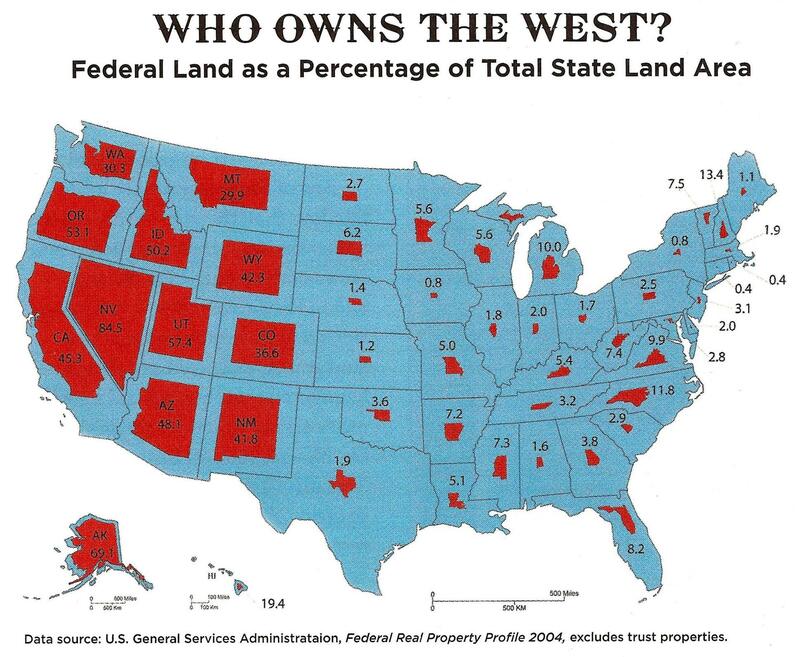 Perhaps not surprisingly, most of the federal owned land lies in the Rocky Mountains and to the West. In fact, the US government owns 47 percent of the land in the western states, versus just 4 percent in states east of the Rockies. The rough beauty of the American West seems as far as you can get from the polished corridors of power in Washington DC. Until you look at the title to the land. The federal government owns large tracts of the western states: from a low of 29.9% in Montana, already more than the national average, up to a whopping 84.5% in Nevada. * The United States Forest Service (USFS), which oversees timber harvesting, recreation, wildlife habitat protection and other sustainable uses on a total of 193 million acres – almost the size of Turkey – mainly designated as National Forests. * The National Park Service (NPS) conserves lands and resources on 80 million acres – a Norway-sized area – in order to preserve them for the public. Any harvesting or resource removal is generally prohibited. * the Bureau of Land Management (BLM), managing 248 million acres  – an area the size of Egypt – has a multiple-use, sustained-yield mandate, supporting energy development, recreation, grazing, conservation, and other uses. * the Fish and Wildlife Service (FWS) manages 89 million acres – an area slightly bigger than Germany – to conserve and protect animal and plant species. Image: Federal Real Property Profile. Courtesy: U.S. General Services Administration / ‘Can the West Lead Us To A Better Place?‘ an article in Stanford Magazine.